When your dog’s otherwise sweet expression is marred by dark, rust-colored tears running down their face, it’s hard to notice anything else. Tear stains can be unsightly and distracting, even mildly repulsive to those who don’t know your dog, and they can be hard to get under control. But there are ways to treat and even eliminate tear stains with a little time and attention. What Causes Tears Stains in Dogs? It all stems from your dog’s tearing, a natural process to keep the delicate eye and its membranes lubricated. Both normal and excessive tearing can cause tear stains, but if you feel like you’re constantly wiping gunk or goobers out of your dog’s eyes, and particularly if it’s thick and has a yellow or green tint, you should take him to the vet. Eye infections, glaucoma, eyelash issues or entropion (where the eyelid is inverted), foreign objects in the eye, and even an ear infection can cause tearing with thicker discharge. 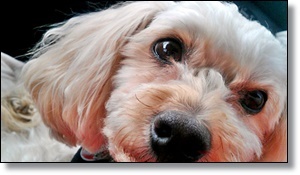 These issues require a veterinarian’s help to diagnose and treat. If the discharge is clear and/or watery but excessive, it could be a blocked tear duct, allergies, or simply due to your dog’s physiology—larger eyes in small breeds or skin folds around the eyes. Some breeds are prone to the issue and require regular attention to keep the area below the eye clean and dry and free of discharge.